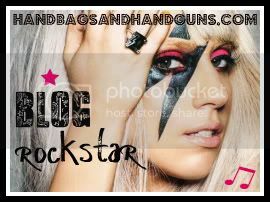 Handbags + Handguns: Rock on, rockstars! This post was not scheduled for today. then unposted it and saved it for another day. Now, here it is again. It's time for me to give my blog award out to the blogs I've recently fallen in love with. Check them out. Be sure to tell them hotpants™ sent you. Cool. I will make sure to check them out. Much Love Illy rocks! She is such a doll! awww thanks a mill Missus Hotpants!!!! I'm so flattered to be included and so excited you entered my giveaway :) All your comments have me elated with delight!! Yay for new bloggie friends! Awww, thank you SO much! This means a lot coming from you, the biggest rockstar of ALL! I am definitely going to check out the other blogs, too. Thanks so much! I'm sorry it has taken me so long to come check it out. Christmas is eating my life right now. What a great idea and I'm so thrilled to be included! Ok, so I totally put that in my sidebar, love it!